You are such a cutie!!!!!!!!!!!!!! Your human actually LEAVES you in the cabinet? Mine is always pulling us out of them. What a great napping spot! Mommy has her oven mitt ready and wants to pet your tum-tum...so watch out! Oh c'mon, Beau Beau, you know you want your belly rubbed!! Oh! No, we are not gonna stick our paws in there! We know what could happen cause we'd do it ourselves. Thanks for visiting us, it was a pleasure meeting you! The mom loves your beautiful eyes with the eyeliner! What a pristine white tummy. I know better than to stick my fingers in there. Luckily, Herman and Emma like belly rubs. what a fun way to begin our visits with you. mama got to rub your soft fluffy belly. 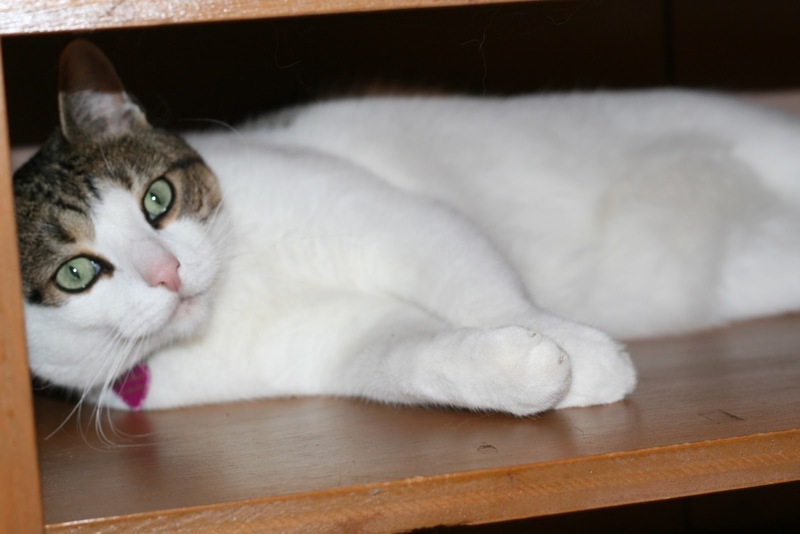 Sleeping inside cabinets is the right place for a good cat ! I admire your beautiful eyes ! It is so tempting to scratch that good looking tummy. It is so darn pretty and white. Hope you have a great nap. You sure do have a comfy shelf spot and you look darn happy there! Everyone, us included, is mesmerized by your jewel-like eyes! Oh, stinky shelves are the best! Teri said she saw some neat attachments for bookshelves on Moderncat once...like steps for us cats! We'll tiptoe away until you've finished napping, Beau Beau.